Courtney Forrester, Program Associate for ICLEI – Local Governments for Sustainability U.S.A., Inc, will give a presentation on the ICLEI program and how a potential partnership between ICLEI and Bridgewater might work. This speech will coincide with the Master Plan Implementation Committee meeting on this Thursday, October 2nd at 7:00 PM in the Academy Building. The presentation is open to the public and free of charge. We would encourage residents that are interested in learning more about sustainability, energy saving programs and more to attend and ask questions to see how Bridgewater might benefit from partnering with ICLEI. This Thursday evening, October 2nd at 7:00 pm there will be a Bonfire and Banned Books Readings to celebrate One Book One Community and Banned Books Week. The Bonfire will be located at the Volleyball Pit at BSC next to East Hall. Parking is available in the Lower Great Hill Lot. Hot chocolate and cookies will be served. And volunteers are needed to read from banned books! If you would like to volunteer to read from a banned book please call Susan McCombe, Director, College and Community Partnerships at BSC at 508-531-2510. Senior Parent Night will be held this Wednesday at 6:30 PM in the Bridgewater-Raynham Regional High School auditorium. The event will go review the college application process and is presented by the Guidance Department. All tryouts will be held at Legion Field on Rte 18. **You MUST attend at least one tryout to be eligible! If you have any questions call Alex MacKinnon at 508-728-6383. We are sorry to announce that Autumnfest 2008 is cancelled due to inclement weather this weekend and for the safety of our members, participants and residents of Bridgewater. 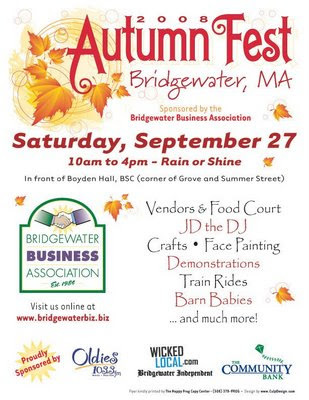 Please contact Pam Conant, The Community Bank, 508-697-8800 , AUTMNFEST Coordinator with any questions or concerns or click here to contact the rest of BBA Directors. The library is currently looking for members to be part of a Volunteer Team. Some of the jobs will include shelf reading, book mending and cleaning, arranging displays, yard work, and much more. If you are interested, come to the library and complete a Volunteer Interest Form. Also library trustee, Ellen Chiocca-Carey is looking for 5 volunteers to serve on a fundraising committee. For more information contact Elizabeth Gregg, Library Director at 508-697-3331. Bridgewater's One Book One Community selection is Ray Bradbury's "Fahrenheit 451". The Bridgewater Public Library has purchased multiple copies for your reading enjoyment. "Fahrenheit 451" is also available from the Download Library by clicking here. All tryouts will be held at Legion Field on Rte.18. You must attend at least one tryout session to be eligible! Any questions call Alex MacKinnon at 508-728-6383. After the Bridgewater Youth Football won last year, the Bridgewater Girls Softball has won the Granite City Electric contest this year!! This evening Bridgewater was selected as the winner of Granite City Electric's "Field of Dreams" Lighting Contest. There were 15 finalists that each received one baseball for every 1500 votes received. 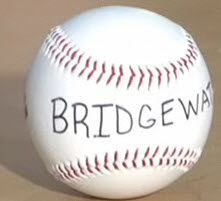 Two towns received two baseballs resulting in 17 baseballs being placed in a "bingo-like" rolling cylinder. The winning ball is shown above. The Bridgewater Girls Softball will win a lighting system donated by Granite City Electric! attend at least five sessions. The library will continue to lock the doors ten minutes prior to closing for security reasons. $65.00 for all players ages 6 to 12 Yrs Old plus $25.00 town fee per player. $100.00 for all players ages 13 to 15 Yrs Old plus $25.00 town fee per player. You will need two checks or money again this year. One check will need to be made payable to Bridgewater Little League and the other one will need to be made payable to Bridgewater Recreation Dept. First year players will need to provide a copy of their birth certificate. A book sale sponsored by the Friends of the Bridgewater Public Library will take place on Saturday September 27th. Friends of the Bridgewater Public Library: 9-10 AM. Gently used books for sale. Location: 15 South Street, Bridgewater. Junior Girl Scout Troop 478 is holding a fundraiser for their Bronze Award Community Service Project (A Christmas Party at Senior Housing). Bridgewater State College Observatory, located on Summer Street, will be open to the public, weather permitting, on Wednesday September 10th from 7 to 9 p.m. Children as young as age 6 and adults are welcome to look at stars, planets and galaxies. For information on cancellations or other weather related issues call 508-537-3275. The Bridgewater Democratic Town Committee announces their September meeting. If you are not a member but are interested in attending to learn more, please email the committee by clicking here. Vote for Bridgewater Girls Softball by September 12! To win, they need your help! Just click on the link below and cast a vote for Bridgewater. Every 1500 votes equates to one entry in the sweepstakes. Tell everyone you know to vote. (Anyone anywhere can vote!). The more votes they get the better their chances for winning! Vote soon as the contest ends on September 12, 2008. A 5 week American Sign Language course will be offered in Bridgewater at the Conant Community Center on Wed. evenings beginning Sept. 10th. The beginner program will run from 5:00-6:30. This class is geared towards those who have little or no signing experience. The NEW advanced/voice off class will run from 6:30-8:00 following the beginner classes. This class is intended for students who have a solid understanding of ASL. Students have the option of staying for both classes. EMT/Paramedic hours and Professional Development Points will be awarded according to state guidelines. Those needing ASL instruction for reasons pertaining to deafness, hard of hearing, non-verbal, Autism, Downs Syndrome will not be placed on a waiting list. The Bridgewater-Raynham Regional School Committee cordially invites you to attend a special reception to Meet and Greet our Superintendent of Schools Dr. Jacqueline Forbes. This event will be held on Wednesday, September 10, 2008 from 4:30 - 6:30 p.m. in the Bridgewater-Raynham Regional High School Cafeteria. Please join us for refreshments as we welcome Dr. Forbes to our Bridgewater-Raynham Community. The pediatric CPR course is taught by Healthcare Educational Resourses. The cost of this life saving course is $35. To register, please call 508.697.5800. 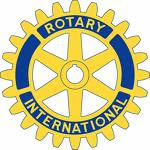 The Rotary Club of the Bridgewaters will meet this Wednesday, at 7:15 AM at Good Days Restaurant located at 99 South Main Street in West Bridgewater. To make a reservation to attend, please contact Bruce Marquis at 508.378.7890.